2018 Pentax Forums T-shirt Contest! Theme: cameras, lenses, and/or photography, incorporating the PF logo (download here) - let your imagination rule. Bonus points for showing off unique Pentax features. You can choose to enter as many designs as you'd like. Once we're closed to submissions, we'll have members vote to select the winning designs. We plan to pick three winners, but may opt for more if there are many exceptional designs. I'm excited to see what you guys will come up with, and I'm sure many other forum members are, too. Good luck and let your imagination go wild! This year, we will continue T-shirt production through Teespring. With two different fulfillment locations, simple storefronts, and prints every 5 days, shipping is cheaper and faster than it's ever been before. I am not a designer but if the designers are interested some of us like simple, patterns. I am thinking of a small logo, left or right at top of chest etc. Just a thought. I agree that I would like a simple design, possible one with the Pentax logo shown large. This first runner up for 2015 would be a good one to consider, however I would prefer a color other than white. 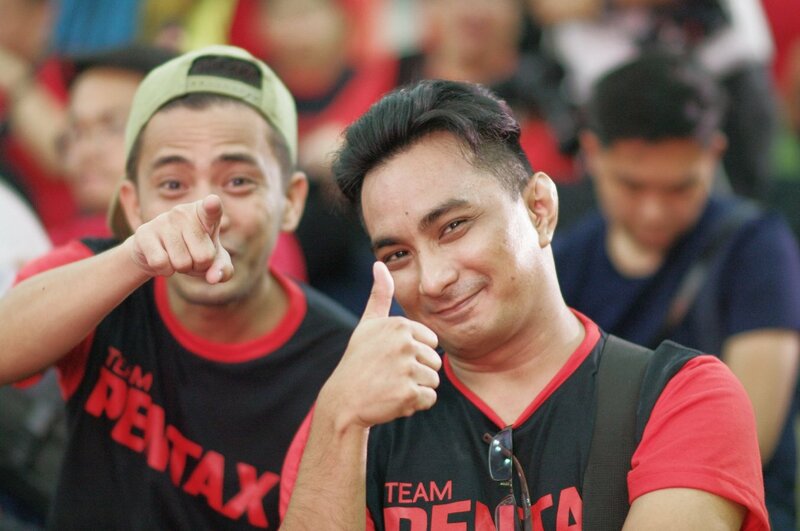 My absolute favorite Pentax shirt I have seen was worn by Team Pentax in the photolympics in the Philippines. I like this simple design so much that I would buy two. Perhaps the Pentaxforums logo could go on the sleeve. I found the image attached below on the Pentaxians Facebook page. The only problem is we aren't allowed to use their logo (font). Still a simliar font could be used. I look forward to seeing the submissions. Simple Pentax text t-shirt based on the Team Pentax shirts. Replaced "Team" with the forum logo. Font: Saira Condensed ExtraBold. Color: 176,24,24. That is a simple design. I didn't consider replacing the word team with the forum logo. I like this design as well, but not sure how I feel about all black. I imagine it would cost extra to have the sleeves a separate color. Perhaps for a solid color, heather gray or another dark gray would be better. For summer attire, I wear white almost exclusively. If I recall correctly, I purchased no T-shirt here last year; two years ago, I purchased only a K-1 design, even though I don't expect to ever own one, because it was the only on-white design I liked ... but that is just me - PF will print what members want. The shirts are avaiable in multiple colors. I think red would work with black, grey, and white. But typically any one design is produced in only two colors - so I was putting in my request for light colored material. Really? Ricoh won't allow the use of their logo on such great free advertising? We can do multiple colors, including both black and white variants of a design, but we can't print a shirt that effectively copies the Pentax logo, such as the above. I'd recommend coming up with a creative way to replace "PENTAX" with a variant of the PF logo, such as what the middle shirt from last year's batch did. Also I don't think Teesring currently offers multicolored fabrics, but I know they're always working on adding new things. I thought if it wasn't the exact font it was okay? Not so? It's a registered trademark and logo. We would need legal, written permission to use their logo. If anybody knows about trademark rights and can contact someone at Ricoh with whom the permit could be negotiated and obtained, please, go ahead. It's fine it's part of an original design, i.e. the prism shirt from 2015, but not in standalone form. Ricoh has historically been generous with us with respect to branding, but I think this approach is also the most ethical one to take, and in spirit with the idea of a design contest. You would have the same concept if you put "Team" where it is in the Pentax shirts, and the "Pentax Forum" thingie where "Pentax" is in the "Pentax shirts.